Black Women Writers-- a timeless book that lays perched on my teeming bookshelf, tattered pages strewn with notes, insignificant to the naked eye. This critical evaluation of Black literary brilliance, that assesses the works of women like Toni Cade Bambara, Audre Lorde, Sonia Sanchez, Alice Walker, and Gwendolyn Brooks, is my Black history. I carry this history with me everywhere I go, indulging in the fictional genius and immeasurable talent of women who look like me and with whom I share the passion for the art of literature. This history fuels my creative prose and for it I am infinitely grateful because without it, I can’t be sure of where I would find my inspiration. 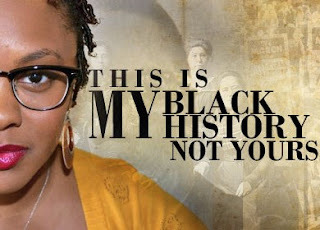 But this is my Black history – not yours. Black history month is proof of America’s obsession with pacifist behavior. A sweet cyclic muse that we court each February, exploiting the notion that Black history is a subgenre of American history and therefore can be relegated to a month filled with partial truths -- one short, concentrated heritage month spent divulging stories that have been diluted due to an overwhelming feeling of White guilt. This guilt urges historians to hide the truth and tell only those heroic tales of Blackness suitable for their grandchildren’s ears. This is not my Black history. Each of us enters February anew. A month that begins and ends just like the others, with affixed holidays, anniversaries, and birthdays. Guilt, tradition, and a fear of discriminatory reprisal will lead teachers and the media to communicate misbegotten lessons that highlight the importance and relevance of Black people and our contributions, but we don’t have to bite. We don’t have to agree to learning only the lessons that post-racialists deem relevant to teach -- a watery, fetishized skeleton of what is one of the most potent and vital legacies in American history. My Black history, the one I celebrate every day, is intoxicating. It’s too vast, too compelling, and too detailed to fit into my pocket or yours. My Black history is shiny. It sparkles with glitter and gold. It’s feminine, mysterious, and integral. My Black history has many names: Baldwin, Carver, Chisholm, Hamer, Baker, and Douglas. It has been recorded and retold in many voices, through many narratives, and doesn’t consent to being muddled under the pretext of comfort. My Black history is tall, dashing, and poised. My Black history is not easily oppressed because it is fundamentally weaved into the foundational fabric of America. Today, history is being strategically decontextualized. States like Texas and Tennessee are fighting to ensure that children learn only what’s easy to digest – only what feels comfortable and nothing more. This certainly isn’t my Black history because in addition to all of the above-mentioned qualities, my Black history is rooted in suffering and sorrow. It can be a sad, heartbreaking tale of death and destruction that weeps angrily. Its unembellished, uncovered body bares deep scars of a long, unforgiving, and vicious experience-- an experience that cannot be denied no matter the amount of discomfort it causes, and an experience that cannot be commercially highjacked or co-opted and then slanted into agreeable information. We are each responsible for our own awareness of history. The vitality of it is subjective. Black history isn’t an impartial regurgitation of facts and ideas; it is a cultural experience that has shaped the lives of not just Blacks but everyone born in this country. It is no less culturally important than other histories. In fact, it is the collective struggle that helps us transcend the idea that our cultural legacies be confined to heritage months. My Black history is my own. It is the lessons I know to be true despite the constant denial. I will tell this history to anyone who asks, anytime of the year because my history isn't a small compliant space. It is shiny and glittery and it sparkles, everyday. This V-Day, protect access to birth control! Womanist AND a sports fan? Help us recruit for ACRJ's young men's program!